2. Dilute 1/2 teaspoon calcium chloride in a few tablespoons of milk (if required). Add remaining milk and whisk well. 3. Heat milk to 30°C (86°F) in a double boiler. Add annatto solution and whisk well. 4. Sprinkle the cheese culture onto the surface of the milk. Wait 2 minutes before whisking well. Cover and ripen milk for 60 minutes. 5. Mix (or dissolve) rennet in a few tablespoons of filtered water. Whisk into milk. 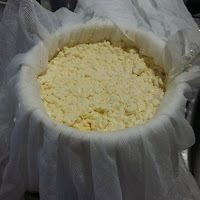 Cover and rest for 45 minutes to develop the curd. 6. Check for a clean break by cutting into the curd with a knife and lifting slightly. 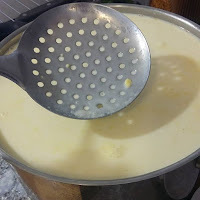 If the edge of the curd splits easily (not too soft) and remains separated in the pot, then it is ready to proceed – if not, wait another 5 minutes and try again. 7a. 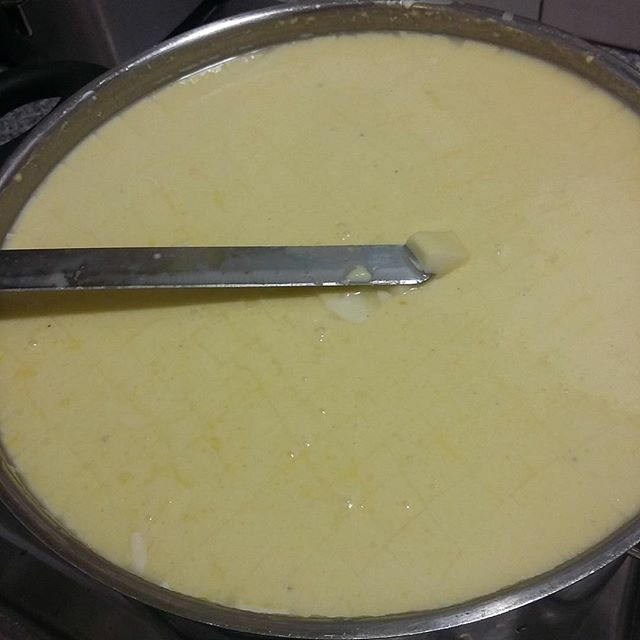 Cut the curd into 1cm cubes. 7b. 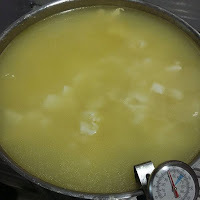 Cook the curd very slowly, increasing the temperature to 40°C (105°F) over 30 minutes. After this, rest the curd for 30 minutes, stirring every 5 minutes (more = drier cheese). 7c. Remove whey to the curd level. 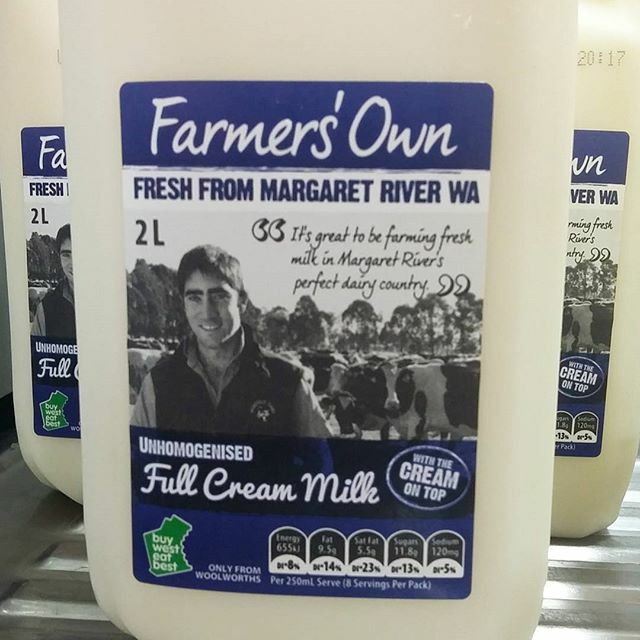 Reserve whey for another use. 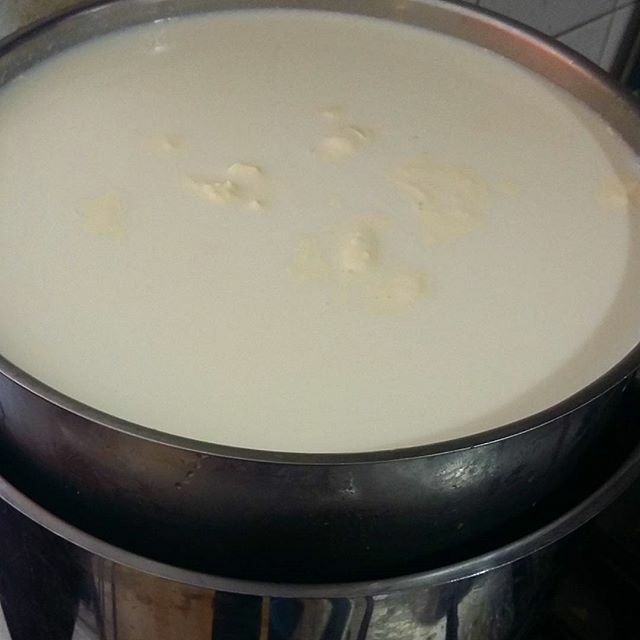 Add room temperature filtered water to reduce curd temperature to 26°C (80°F). 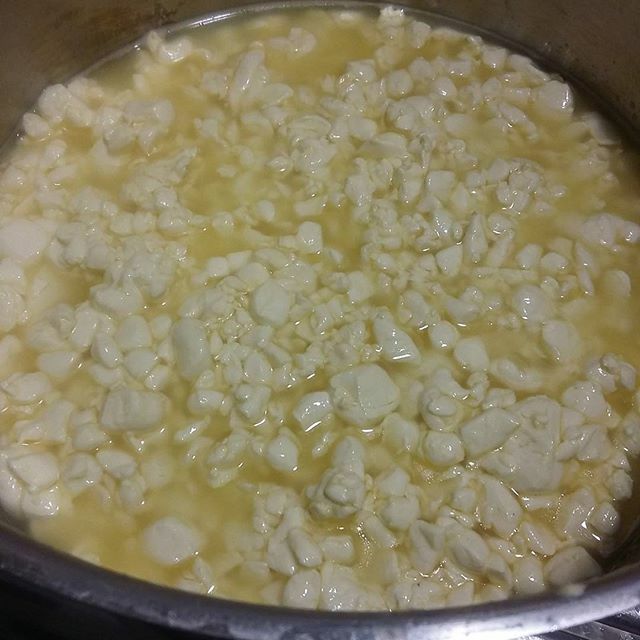 Stir curds for 15-30 minutes. 8. Drain the curds in a cheese-cloth lined colander. 9. Mill the curds by placing the drained curds into a bowl and stir to break into very small pieces (0.5cm or smaller). 10. Sprinkle milled curds with salt and mix well. 11. Line a round cheese mould with cheesecloth. Add salted curds. Fold over cheesecloth. 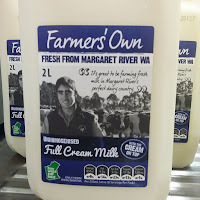 Press for 30 minutes at approximately 9kg (20 pounds), then flip and Press for 30 minutes at approximately 9kg (20 pounds), then flip and Press for 1 hour at approximately 18kg (40 pounds), then flip and Press for 8-12 hours at approximately 22.5kg (50 pounds). Uncover pressed cheese and soak in brine for 8 hours. 12a. Place cheese onto a cheese mat. 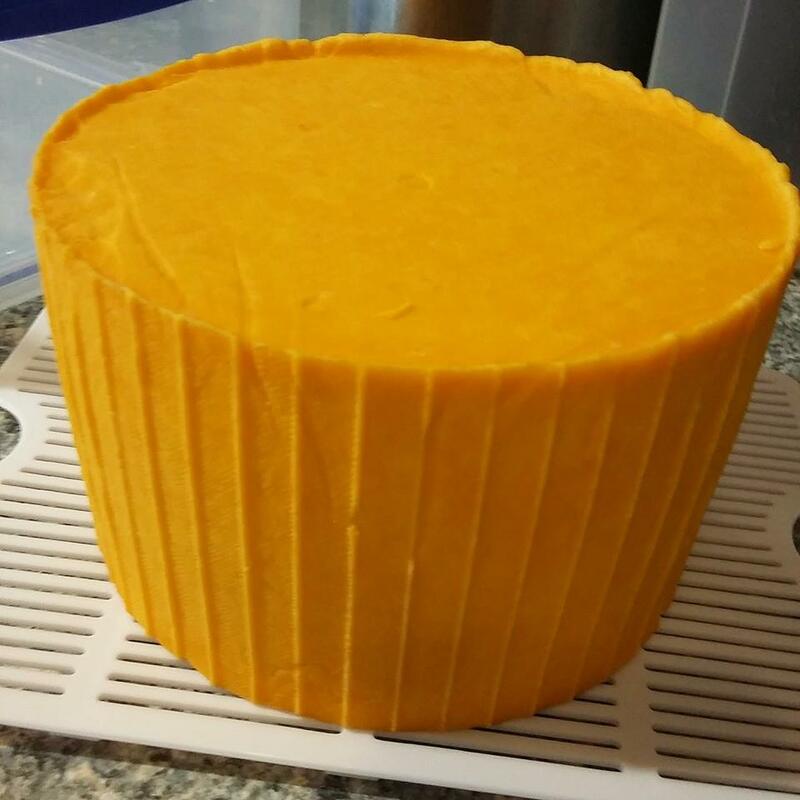 Leave cheese at room temperature to develop a natural rind (1-7 days) away from sunlight, heat and moisture. 12b. 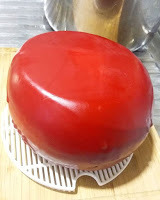 Ensure cheese surface is free of dust and mould (rub with salt water to remove and then dry the surface) before dipping the cheese into hot red cheese wax (or brushing wax on). 12c. 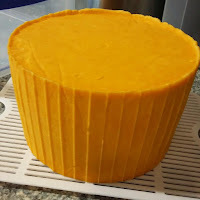 Label and date the waxed cheese before placing into the cheese cave to age for 4-6 weeks at 13°C (56°F) and a humidity around 80%.